Cambodian city of Siem Reap is the nerve center of all tourist activities in Cambodia. This is so, because majority of sites, visited by more than 2 Million tourists each year, like Angkor Wat, connected with ancient history of this country, are located in the vicinity of this city. 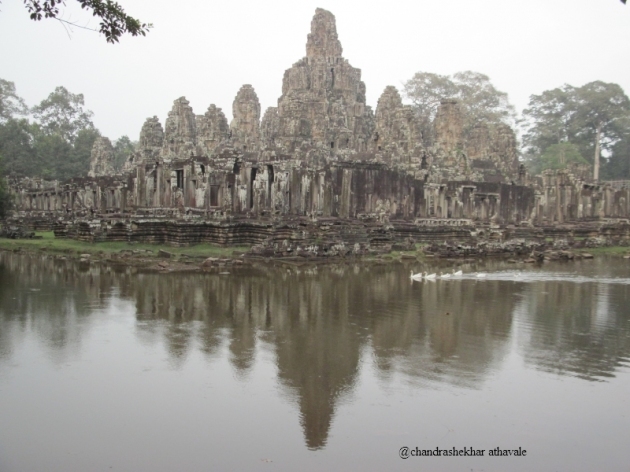 One of the greatest sites near Siem Reap is the ancient city of Angkor Thom. Angkor means 'Nagari' in Sanskrit or a city. This Thom city, was built by Khmer King Jayavarman VI as his capital, during his rein (1181-1220). It is of exactly square shape, each side of this square being 3 Kilometers wide. It covers an area of 145.8 hectors or 360 acres. The entire city is enclosed within a solid stone wall and then further protected by a 100 meter wide moat. There are five gateways to the city each having an entry Gopura or tower. Zhou Daguan, a Chinese emissary to Khmer kingdom has chronicled how this city looked during its glory. He writes about the golden towers on Bayon temple and a Golder bridge with Gold lions on either side. There is a dense forest on either side of the road. It is rather difficult to imagine today, the magnificence of this ancient city as described by the Chinese emissary. The famous temple of ‘Bayon’ is located at the exact geometric center of this great city of Angkor Thom and is one of the major tourist attractions without any doubt. Just northwest of this magnificent temple, is another huge temple known as Baphuon. I had paid a visit to Angkor Thom, sometime in 2010. At that time this temple was out of bounds for the visitors, as it was under renovation. 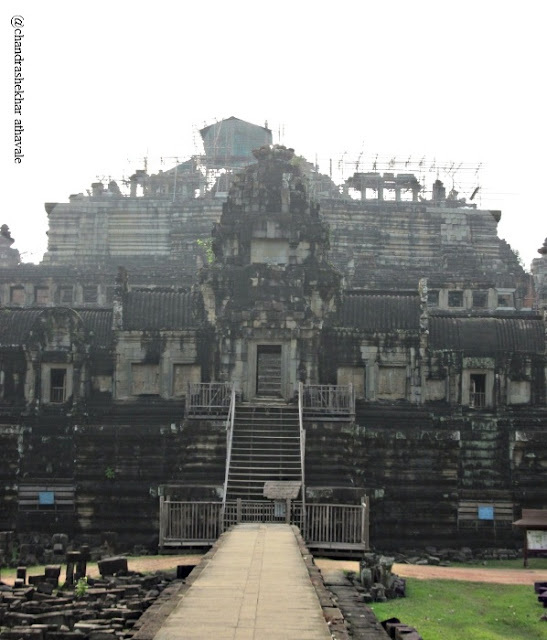 Baphuon temple was built by the Khmer king Udayadityavarman II, sometime during 11th century. During its glory days, the central tower was covered with bronze. There is a long bridge like elevated passage, which leads one to the temple. This temple, dedicated to the Hindu God Shiva, had appeared really very big to me. Outer wall of the temple covers an area of 425 by 125 meters and the entire courtyard of the temple was full of thousands of stones with numbers painted on them. I had wondered then, about those numbers and what exactly was going on. I was only told that the French Government was rebuilding the temple. I however found out later, that the rebuilding process did not turn out to be so simple and straight forward. The Baphuon temple was once among the finest of the great monuments of Angkor, but by the 1950s, it was on the brink of collapse. A French-led team of archaeologists decided that the only way to save the temple was to take it apart piece by piece and reconstruct it. The work began in 1960 and the entire temple was disassembled into some 300,000 individual stone blocks. Each stone block was individually painted with a number matching an entry on the rebuilding master plan. All the 300000 pieces were systematically laid down in the surrounding jungle. 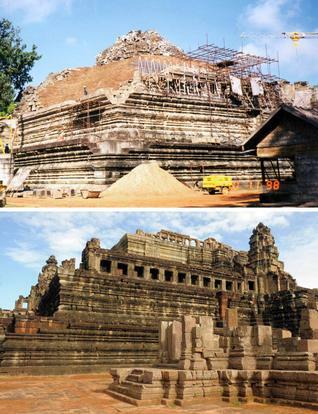 Before reconstruction could start, civil war broke in Cambodia and all work on Baphuon had to be stopped. Khmer Rouge, the hardline communist regime that took power in 1975, got hold of the master record and destroyed it in a thoughtless action. After the civil war was over, the French team wanted to start re assembly of the temple but then it was found that the records have been destroyed. It caused further delay. However the French team was not deterred with the loss of record and decided to start the work. The reconstruction was finally restarted in 1995. Because there were no records, the reconstruction work was like solving a three-dimensional jig-saw-puzzle with 300,000-pieces. But for this puzzle, there was no picture to guide or tell how assembled temple would look like. Fortunately, the original construction had not used any mortar to fill the cracks between the stones. This meant that each stone had its own place. There were no two blocks that had the same dimensions. The team leader of the archaeologists admits that the initial part of the reconstruction was the toughest. The French archaeologists finally managed at the cost of 10 million Euro, to complete the reconstruction of this pyramidal temple last year or in 2011. It was not possible to reassemble all the 300000 blocks back into the temple. Some 10,000 blocks are still lying in the courtyard. Baphuon temple was finally re-opened for the tourists in July 2011, at a ceremony attended by Cambodian King Norodom Sihamoni and French Prime Minister Francois Fillon. 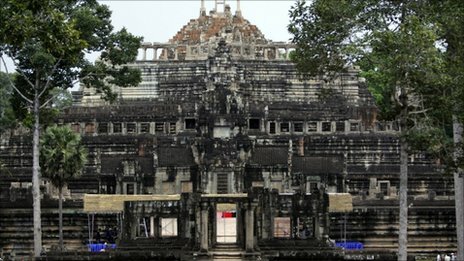 French Government now wants to restore Western Mebon temple in Angkor park at the cost of 2.7 Million Euro. The Phoenix has risen again from the ashes. All those, who would visit Siem Reap in future, can visit this temple.